Maslow’s hierachy of learning needs (1943). 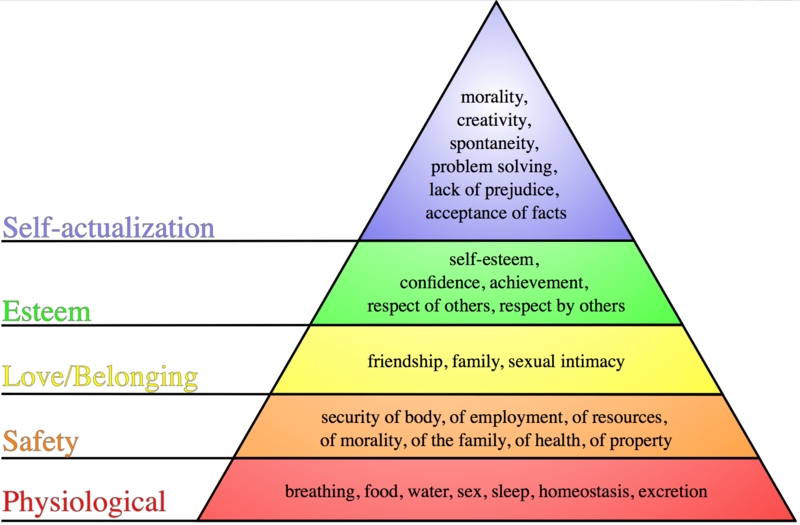 Maslow’s hierachy is one of the first theories that I came across in medical education. The theory rests on the idea that we have certain needs in order to learn and that these are hierachical. We will not be successful at moving onto higher levels until we have been motivated through the lower levels. If our lower level needs are not met we cannot achieve the higher levels of self actualisation (think of this as achieving your potential). The original hierachy has 5 levels and is typically presented as a pyramid. At the most basic level the physiological needs are required to allow you to learn. You can’t learn if you don’t have food, water, warmth, shelter etc. OK. You might be able to learn something but at the very least it is a distraction. #LP- make sure your learners are comfortable not distracted to learn. It’s a good reminder of the importance of the environment (time, place, organisation) of any teaching session. Safety needs are about feeling in a secure place to learn. In most of our teaching it’s unlikely that you are going to be attacked by a bear so although Maslow did think about things like security and law and order this is really about reducing anxiety. #LP Learners who are terrified don’t learn well. Do what you can to put them at ease. Many hierachies take the Love out of Belonging which I’ve always thought to be a great shame. This is a need to be social and interact with others. Those of us involved in social media know that this is really important and I would argue that for careers like Emergency Medicine this aspect is one of the reasons why social media has been so important. We find it tricky to interact as a group face to face whilst working shifts. #FOAMed allows us to create a sense of love and belonging to a group irrespective of time and place. #LP It’s better to learn as a group. Esteem can be thought about in two ways. Firstly what others think of you and secondly what you think about yourself. If people think that they are doing well and are recognised for doing well they will learn well. Self esteem, achievement independence and status help learners feel good and promote them to learn and engage. #LP Make your learners feel good about themselves. These first 4 needs are considered to be the basic needs. The 5th level of self actualisation is a term that denotes a desire for self fulfillment. It is therefore a state where the learner is motivated to improve and reach their peak as opposed to being motivated simply by the need to mitigate deficiencies. Maslow’s approach is to promote what can go right, not just what can go wrong with people. I think this is a really positive way to look at the world and clearly something that educators should promote. Self actualisation for each of us will be different and it’s not something that we have all of the time. #LP Self actualisation comes from a desire to achieve not to mitigate deficiency. Whilst retaining the original basic needs the exapnded hierachy tells us more about what motivates our learners. Need for Knowledge (cognitive needs) is a desire to know something. Again as a motivation for learning we need to ensure that our learners know why they want to learn something and as educators we need to know what is driving their learning needs. Why do they need the knowledge, what motivates them and how are they going to use that information. #LP Understand why your learners want to learn. Aesthetic needs are a need for beauty, order, balance, symmetry. We have a desire to enjoy the things that we experience. It’s not just visual aesthetics but sound, feel, touch are all important in motivating people. In education, think about presentations with beautiful slides, podcasts with great audio, videos with great music. Do they motivate you to learn and engage (of course they do). #LP Make your teaching aesthetically pleasing. Transcendence needs are why we are here, looking beyond ourselves to others. Once we have achieved our own self actualisation then there is a moral argument to share that with others through education, compassion and effort. By helping others we are helping ourselves achieve higher levels of learning we support our own needs and through transendence share this with a wider community. I would hope that Maslow would recognise #FOAMed as transendence in his hierachy. #LP Transendence is helping others to achieve their self actualisation. Maslow’s hierachy appears in pretty much all talks on educational theory. Although usually presented as a hierachy of needs many commentators describe it as a way to understand how learners reach their potential and what barriers might exist to them getting there. For me as an educator it’s a great reminder that it’s not just about what I do in the teaching session. The success of an educational intervention is deeply influenced by the learners experiences, motivations, behaviours and psychology. We can do much to accomodate them to make learning better. There is so much more that we could talk about with Maslow, it’s a great theory in that it is both very simple but also deeply complex once you dig beneath the surface. Maslow’s hierachy of needs for an engaged social media audience.